The AN/TSM-196B is a general purpose scoring system support equipment suite for determining the operational status of scoring equipment on the bench or during preflight checks. The AN/TSM-196B consists of four (4) elements: a Radar Input Stimulator (RIS), a Receiver Processor Unit (RPU), a Radar Antenna Coupler (RAC) and a Telemetry Antenna Coupler (TAC) along with miscellaneous cabling and mounting hardware for the antenna couplers. 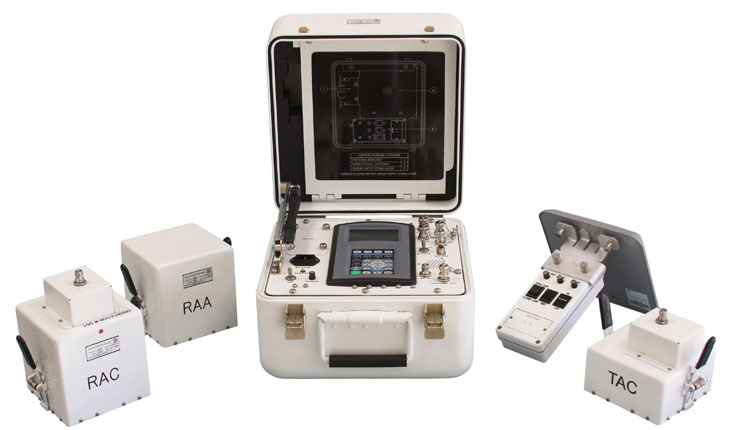 The RIS simulates passing projectiles for the scoring system and can be used either in a free space radiation mode or in a cabled configuration. The RPU contains an integrated telemetry receiver, bit synchronizer, and PCM decommutator capable of use with scoring systems utilizing PCM encoded telemetry data streams in the L and S band frequency spectrums. The RAC provides controlled coupling between the RIS and the scoring system radar antenna when precise measurement of system performance is required. The TAC provides controlled coupling between the RPU and the scoring system telemetry antenna when precise measurement of system performance is required. The system operates by providing a known Doppler return signal to the scoring system, detecting and processing the output of the system via its telemetry link then comparing the results to anticipated performance levels to determine the health of the scoring system.